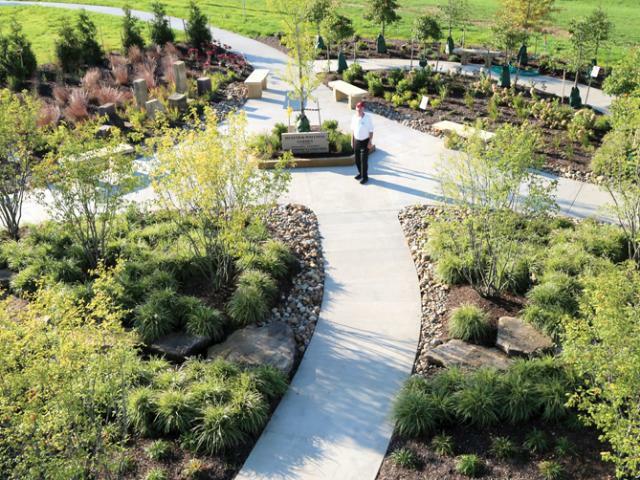 OARDC’s Secrest Arboretum has many gardens, but its newest addition stands out for its therapeutic and research value. Dedicated in September, the Lemmon and Rice Health and Wellness Garden was designed to boost visitors’ sense of well-being and to provide opportunities for research on the impact of gardens and nature on people’s health. The 115-acre arboretum is on OARDC’s campus in Wooster. The arboretum’s interim director, Joe Cochran, said a number of visitors use the facility in their wellness programs. Secrest Arboretum partnered with Ohio State’s College of Nursing to come up with a concept for the garden, to make decisions about its design elements and to conduct future research projects. The garden focuses on six of nine pillars of wellness: environmental, physical, intellectual, emotional, spiritual and social. The pillars “tie into how well a person feels overall,” said Usha Menon, former professor and director of graduate nursing science programs in the College of Nursing. To contact the source: Joe Cochran at cochran.58@osu.edu.